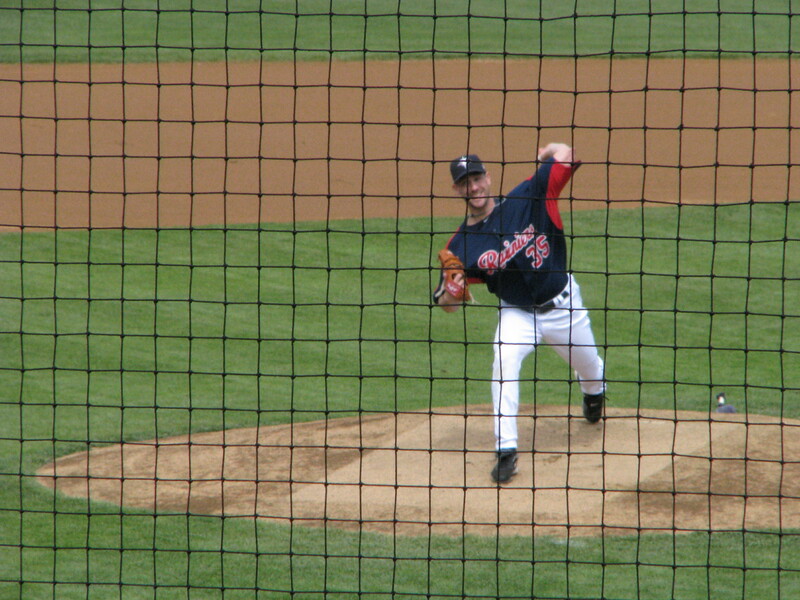 I just got back from Cheney Stadium, from a 4-1 loss at the Cliff Lee start. I had such high hopes. The Mariners got swept, a one-run game (again) that was decided by a home run (again). Franklin Gutierrez seems to be smacking them out of the park, so there’s that, but it’s not enough. We seem destined for badness while on the road, and there is some sort of weird upside-down and backwards Evil Twin of the baseball universe: I’m used to the Padres, Marlins, and Nationals not being very good, but this year things are starting off a little differently. Maybe everything will even out eventually, I don’t know. It’s just bizarre. So Conor and I went to this game, and really, there isn’t anything I can tell you about the actual game that isn’t already written here, or here. It is, however, nice to see that everyone’s photos come out looking a little oddly washed out, and that it’s not just me. 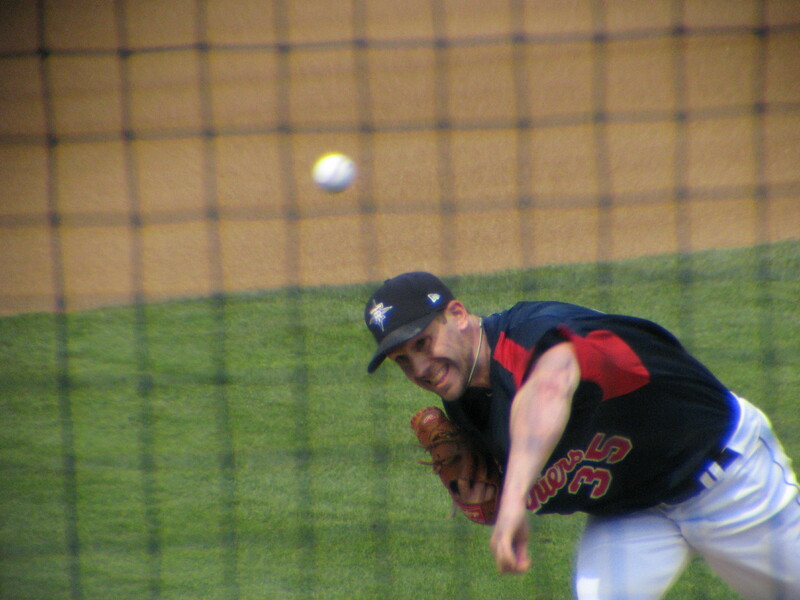 I have never had much luck with getting good pictures at Cheney, and I’m not sure why. 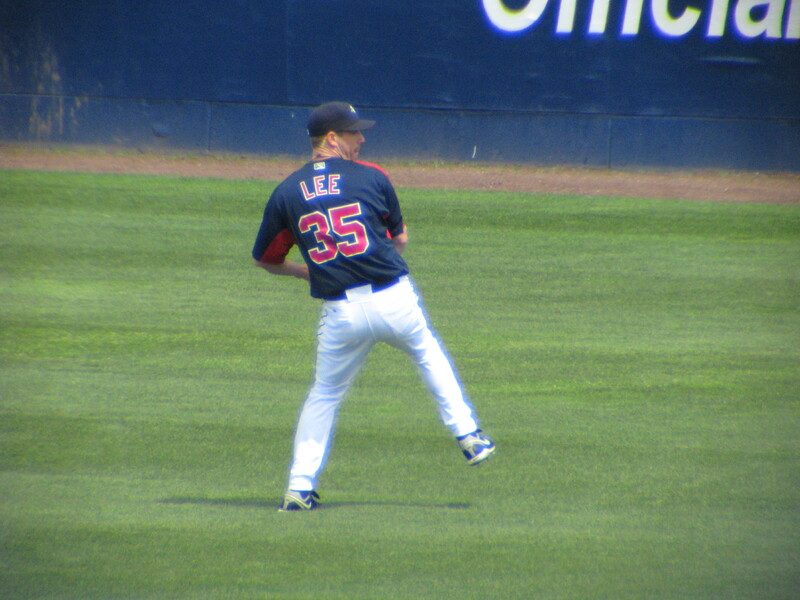 The game was fine through the 6 innings that Lee was on the hill – no runs, one or two hits, things looked solid. Lee let the Salt Lake Bees get the bat on the ball, but those hits were nothing that the infield or outfield couldn’t manage. The first hit obtained by the Bees was a bunt by Peter Bourgos, and while there was probably not any way Lee could have made it to cover the bag with Bourgos’s speed, he didn’t really try, either. When Lee was taken out after the 6th inning in favor of Mike Koplove, our bell started to toll. Mike Koplove is no Cliff Lee, and the Bees took advantage of that fact to roll over him like a train, bringing in a total of 4 runs in the 7th – not many, but it was all they needed to win. The final score was 1-4, Bees. To add insult to injury with this loss and the sweep, I found out after I got home that the Detroit RedWings also got pounded 5-2 earlier this morning, and the Sounders got taken to task by Toronto this morning/afternoon their time as well. The only team that has won anything in the past 24 hours has been the Baltimore Orioles, but that is of little consolation for me. This has just been an awful sports weekend. 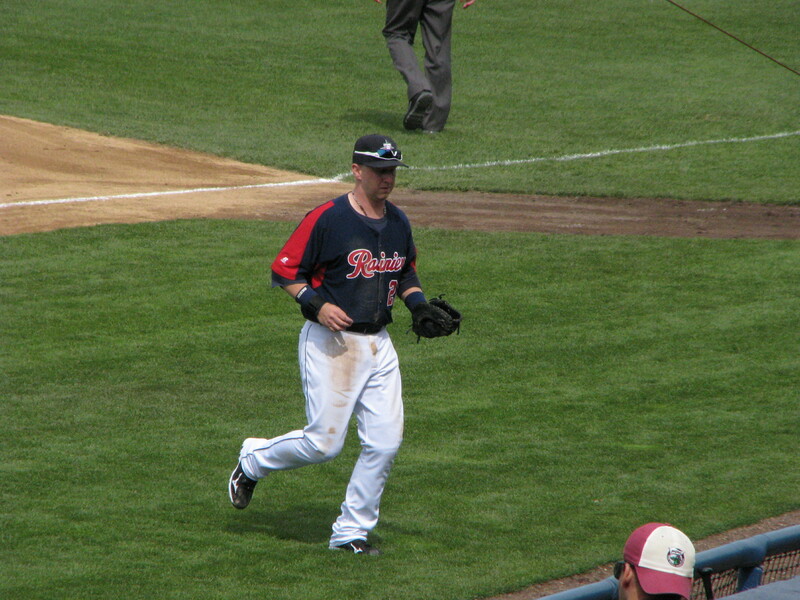 Mike Carp comes back to the dugout after a dismal 7th inning. 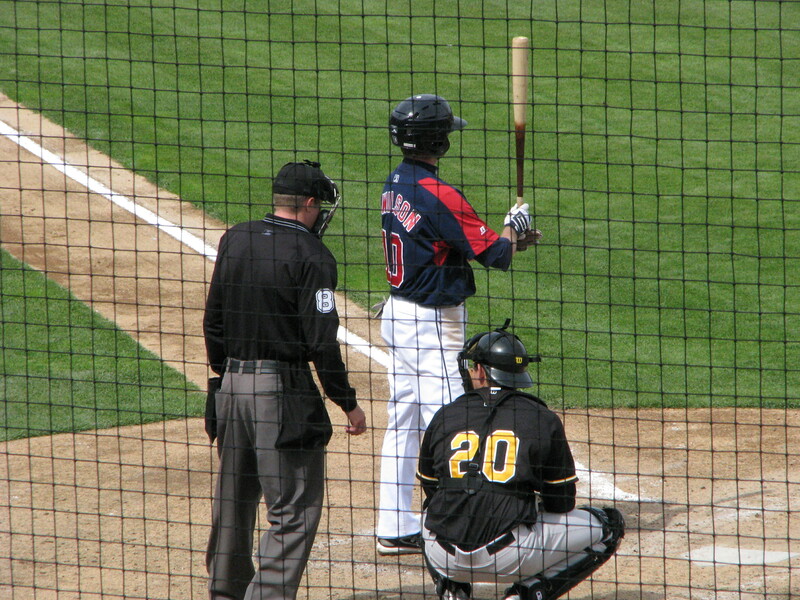 Josh Wilson, sizing up the Bees pitcher. 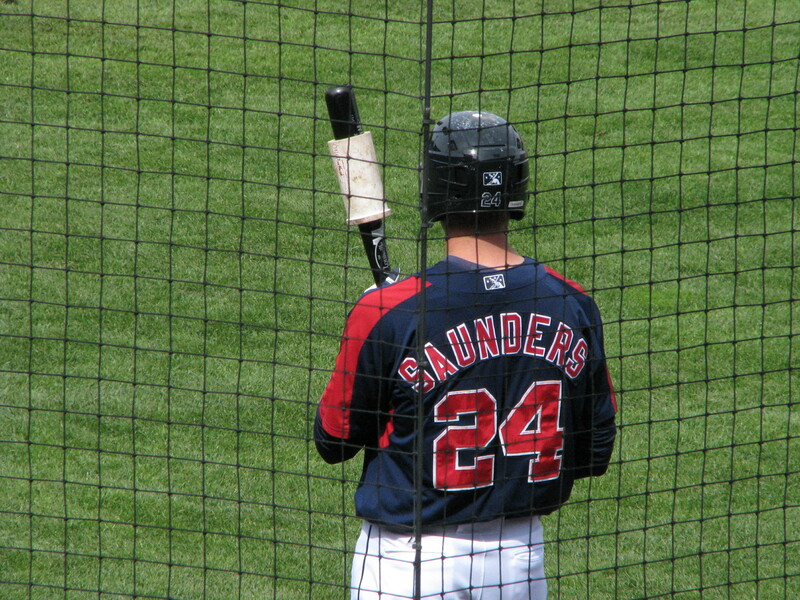 Michael Saunders and Josh Wilson. That netting was the bane of my existence today. 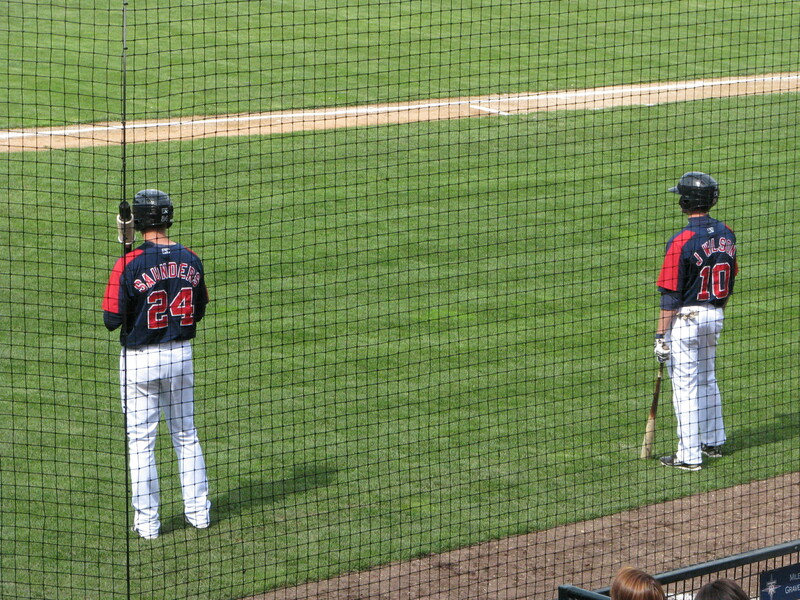 Tommy Everidge may be one of my favorite minor leaguers. I have no idea why. During Opening Day, I was rather impressed with his ability to move, especially being built the way he is. Just another of my nonsensical player attachments, I guess. Speaking of those, no Garrett Olson sightings to speak of. 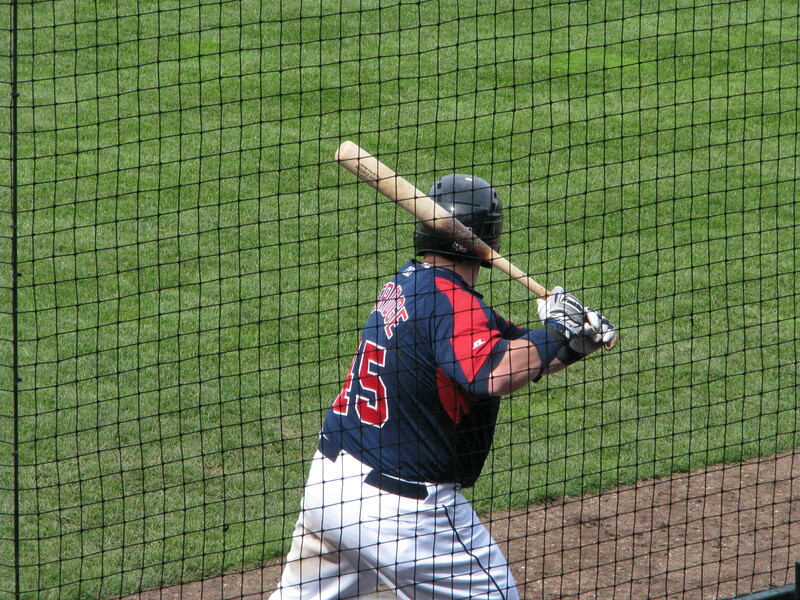 I hear that Paul Marsh may have a photo from BP earlier today, but I never saw him during the game. Of some possible interest (I found it interesting, anyway) is this little tidbit from Jon over at ProBallNW. For the record, last year I went from being in the “PR stunt” camp to loving Ken Griffey Jr, a player that I had no previous relationship with like everyone else in Seattle. When they signed him again this year, I didn’t complain, because, like a lot of others, I trusted our front office. But watching Junior bat this year has been dismal to say the least. Once again, we have stocked our team with designated hitters that can’t hit. It didn’t take me long to change my mind about Mike Sweeney, either. I love ’em both, but we need bats, and even though I know I’m in the minority for even thinking this, I’m hoping that Griffey either starts hitting a little, or decides that mid-season retirement might not be a shabby idea. I’d rather see him go out with style; when I hear other people around me acknowledging that they’re only cheering for Junior because it’s Junior (as opposed to counting on him to whack it out of the park), it might be time for going gracefully. Whether gracefully means the 60-day DL in July or ratcheting up the batting average, well, that’s up to Griffey. Tomorrow night is Kansas City and Felix Day, and I can only hope that our boys can pull out a win. I’d hate to think that this is the year we only do well at home, regardless of how many tickets I wind up with for home games. We’ve slipped behind the Angels again, and are only one game removed from Texas. Pretty please, a win on Felix Day? Sorry I didn’t make it over and say hi. Yes, my photos were washed out…and those were the ones I chose to publish! Yeeesh, some weird lighting. But we’re all just waiting for Positive Paul’s shots, aren’t we? Every single photo I take there – telephoto or not – is just awful. I’m starting to wonder if that big blue wall might have something to do with it. Paul got some good ones – he was like a shark, all over the place with his rig. He had to have gotten some killer ones up front. That thing probably cost more than my car! haha! Tommy Everidge is like the Pillsbury Dough Boy. Poke him in the tummy and he jiggles. I mean giggles. He can move so fast though! It’s surreal! haha! well, focusing thru the screen is always a challenge, but it looks to me like the problem is white balance as the game goes on. I’ve given up trying to adjust for it and just fix it in photoshop when I get home. 19 games! Be strong. I put money down in Vegas in December for the Mariners to take the ALCS. I still think it can happen. I’ve tried futzing with the white balance, but I can’t seem to get it right. I am getting tired of white pants! haha!